University Hospital Kerry is conducting a review of over 46,000 scans or files, involving over 26,700 patients. The review involves a range of scans including X-rays, ultrasound and CAT scans. The period in question is from March 2016 to July 2017, and covers patients from Kerry, north Cork and south Limerick. Concerns emerged during the summer, when three serious reportable events were notified regarding an employee and an initial audit of a sample of scans was conducted. The employee no longer works at the hospital. One case was identified in July and two in August. The decision to undertake a major look back of 46,000 images was approved by the National Director of the HSE's acute hospital division in late August. The issue was also communicated to the Patient Safety Unit at the Department of Health. So far, up to last Friday, the look back ordered by the hospital had reviewed close to 18,000 scans or files. Arising from these reviewed cases, 21 patients were recalled, and no major missed cases were identified. No critical missed diagnoses have been reported to date. However, some diagnostic errors have occurred and a small number have led to delays in the correct diagnosis and appropriate treatment. Patients affected have been contacted and are receiving follow-up care. Six external radiologists are involved in the review. The hospital has been contacting patients and their families through their GPs. In a statement to RTÉ News, the South/SouthWest Group, which covers University Hospital Kerry, confirmed it is investigating patient safety concerns at the hospital. It said that a 'look back' process with independent oversight is under way. The review is expected to be completed within eight to ten weeks. A clinical co-ordinator has been identified to liase with patients and arrange appropriate follow-up care. The hospital group said that any patients deemed to require urgent intervention will be immediately contacted before the full audit is complete. Dr Claire O'Brien, Clinical Director at University Hospital Kerry, said there has been some serious cases of delayed diagnoses at the hospital and she wanted to apologise to families for distress caused. She told RTÉ News the hospital was dealing with the issue as quickly as possible. The Minister for Health Simon Harris said he has been assured that all necessary steps are being taken and he is being kept updated on the matter by his department. 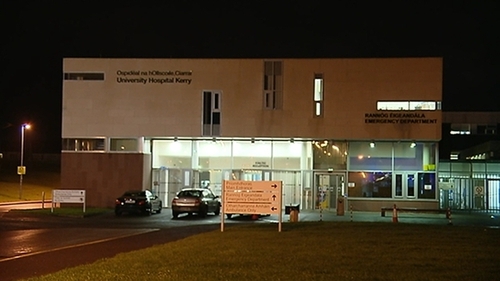 A dedicated information line has been set up at University Hospital Kerry. The number is 1800-742-900 and will operate from tomorrow at 9am to 5pm, Monday to Friday. The SIPTU union, which represents radiographers at University Hospital Kerry, said they had raised concerns with management that the department was short staffed, not fit for purpose and unsafe. The concerns were included in a letter to the hospital dated Wednesday 13 December last and seen by RTÉ News. The letter said that radiographers were being overwhelmed by demands to provide a wide service with insufficient resources. Paul Bell, SIPTU Health Division Organiser, said that an independent review of the unit about a year ago had made recommendations which had not been implemented. Mr Bell also said the review of over 46,000 images at the hospital was placing huge pressure on the unit and extra resources were needed. The employee linked to the current scans review is not a radiographer. Mr Bell said that radiographers had received no briefing on the scans review, or guidance on the information they should provide to patients as to the reason for the recall. He said it left radiographers in a difficult position with patients who were clearly upset and distressed at the reason for the return visit.